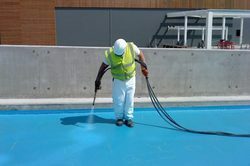 We are a leading Manufacturer of swimming pool waterproofing services and anti slip flooring services from Palwal, India. Backed with years of experience of this domain, we have been able to offer the finest collection of Swimming Pool Waterproofing Services. With an aim to fulfill customer’s request, we bring forth a complete spectrum of Anti Skid Flooring Service.